Donald Glover and Brian Tyree Henry in Atlanta. Donald Glover, the star and creator of the FX series Atlanta, maintains a rap career under the name Childish Gambino, and anyone who saw Glover as Troy Barnes on Community will think they have an idea of what a childish Gambino is like. Troy, a high school football star tentatively easing into adult life as a community college student, initially came across as kid’s idea of a confident, swaggering jock, but that’s because his aggressive, socially well-adjusted persona was a pose. Once Troy embraced his true character as a lonely nerd in search of a playmate and began spending all his time playing games and obsessing over old TV shows with the master nerd Abed (Danny Pudi), he grew increasingly childlike, to the point of losing his jock’s sexual aura and becoming a human stuffed animal. It was to Glover’s enormous credit that he managed to make this seem less like a regression than like the self-realization of someone who’d been hiding behind a false front and needed some time in the playroom before becoming an adult. 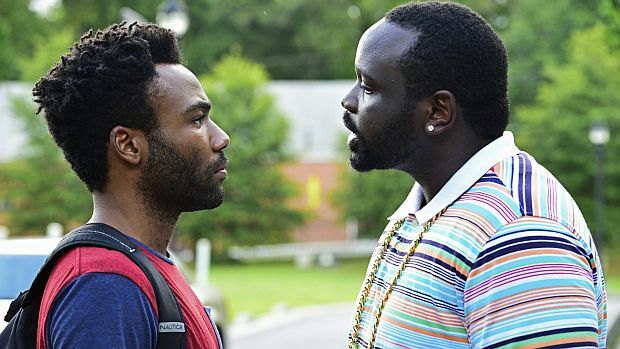 For fans of Community, or even Glover’s often witty and intoxicating nerd-rap, the first surprise of Atlanta is that Glover – lithe, bearded, and heavy-lidded – is very much an adult. As Earn, who’s back home in Atlanta after dropping out of college, he has the presence of a man who’s been kicked around the block a few times and is ready to claim his place in the world and do right by the people he cares about. If anything, he’s more precariously lost than Troy, in the limbo of his community-college safe space, ever was. Earn arrives in town with no money, job, or prospects, just an uncertain relationship with Vanessa (Zazie Beetz), a schoolteacher who’s the mother of his baby daughter. Troy’s face would sometimes freeze in an expression of smiling terror when he was afraid reality was about to catch up with him and present him with something he couldn’t bluff his way out of. Panic seems to be outside Earn’s emotional range, even when, in the wake of a ridiculous shooting incident, he’s arrested and has to spend most of a night and much of the next day idly waiting for bail money to arrive. 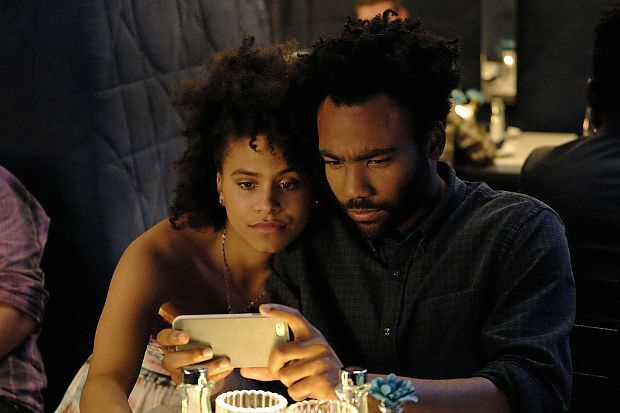 Zazie Beetz and Donald Glover in Atlanta. There’s anger and disgust in Atlanta, but the miracle of the show is that they manage to inform and enrich the story without killing the comedy. The show never feels bitter; at worst, it’s resigned, and Glover’s wary, weary, improvisational quality suggest the resourcefulness it takes to navigate a minefield that he can never step out of and that keeps shifting. He may seem under-motivated, but he keeps trying to go with the flow. Formally, the show keeps shifting, too; Vanessa may take over for an episode, or a story about Earn and Albert’s activities at some kind of celebrity charity basketball event may cut away to an unrelated scene of Albert’s sidekick Darius (Keith Stanfield) being ejected from a shooting range for offending the sensibilities of the white customers by shooting the targets featuring pictures of dogs. Another episode may be taken up with a parody of a solemn panel-discussion show on a BET-style network, complete with commercials for cars and alcoholic beverages pitched to what Don Draper would call the “urban” demographic. (Albert has been called on camera to defend himself of charges of sexism and transphobia; some of his lyrics appear to dis Caitlin Jenner.) Or the show’s gently naturalistic surface may be rippled by a touch of surrealism: at the basketball game, Albert gets into a beef with Justin Bieber, who’s played by a young black actor. Even with its jokes about explosions of urine and outbursts of absurdist violence, Atlanta has a beautiful, lyrical dreaminess, as if Earn were fantasizing the whole thing while riding Vanessa’s couch. The exact nature of everyone’s lives and relationships tend to get fuzzed over: it’s not clear how big a celebrity Albert is meant to have become, and he doesn’t seem to share Earn’s conviction that Earn is his manager, just as Vanessa doesn’t share Earn’s conviction that the two of them are fated to be a couple. This never feels sloppy and infuriating, like, say, the difficulty a viewer might have sometimes had keeping track of who on Mad Men was well aware that Don Draper wasn’t really “Don Draper.” Like the show’s refusal to turn melodramatic even when Albert and Darius are in the woods at night conducting business with a fellow they seem to have interrupted while he was in the middle of having somebody murdered, it feels like a concession to the mess and uncertainty of life at a time when the Internet can turn people into stars overnight and ruin their lives just as quickly, and a major party presidential candidate may be a buffoonish, unelectable carny act and may also be revealing how much of the democratic electorate craves an authoritarian dictator. In its free-form approach to the half-hour TV comedy, Atlanta might not have been possible without Louie, which may yet turn out to be one of the productively influential TV shows of its time. What held Louis C. K.’s swirl of situation comedy and satire and memory play and surreal fantasy together was the feeling that you were always getting a piece of how one man saw his life. Atlanta feels as if you’re getting life itself, with a fanciful but sane hand at the tiller.